Recently, my wife and I celebrated our 18th wedding anniversary with a weekend trip to Aspen. Neither of us had been before and we were floored by its beauty--not that of the celebrities, mind you, but that of the Roaring Fork valley. 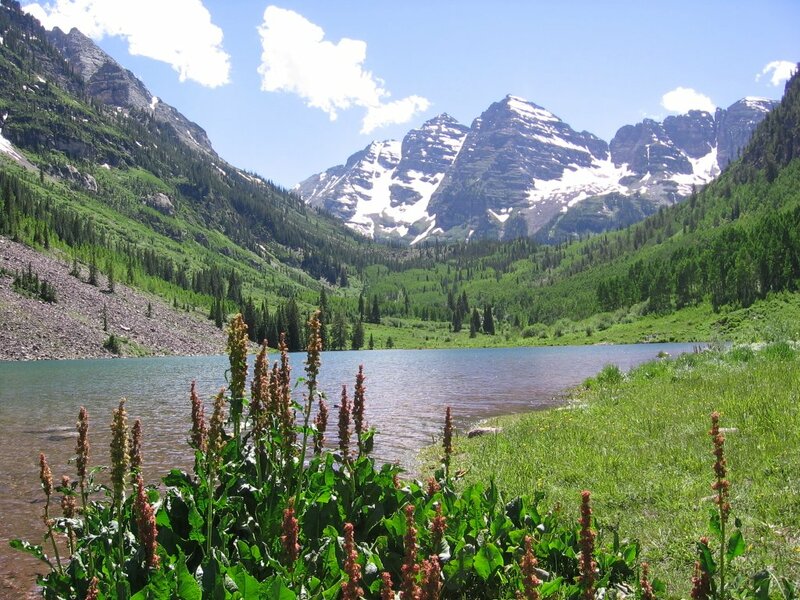 In particular, we were stunned, breathless really, at the gorgeous Maroon Bells (left). I'm a bit embarrassed to admit it, but upon seeing them, I blubbered like a baby. I was overcome with emotion at such unspoiled, pristine beauty. For me, it was a direct hit of divinity, a tangible sign of God's handiwork, a delicious (though at the same time painful) arrow into my soul. I tell you, I enjoyed more unselfconscious worship and praise in that moment than I've had in many church services. Somehow, struck with God's artistry and goodness, I was transported delightedly off-center: off the center of my self-absorption, off the center of anthropocentric living, off the center of all that's wrong in the world. I think, in some respects, this is biblical worship: the joy of moving off-center and becoming absorbed by a good and loving God. As N.T. Wright describes it in his very good new book, Simply Christian, beauty is the echo of God's voice, a haunting and delightful ache that can lead us to the heart of our Creator, who is also our loving Father. Off-center...eccentric...not such a bad thing! i often think that general revelation can be seriously underrated. moments of general revelation create the foundation and context for which special and direct revelation make sense. I see this especially in Isaiah 40, where god's glory is the context for our comfort. John, I think you're right, provided we don't make the mistake that the early 20th century German theologians made, by trying to look to general revelation for our soteriology. As Lewis once pointed out, nature can teach us, in addition to great beauty, great depravity (after all, in some cases adults eat their young). These same theologians fell into the trap of Nietzsche, et al in defending the survival of the fittest. But all in all, we evangelicals need to reaquaint ourselves with the good aspects of what nature reveals about God--especially in our postmodern milieu.